The latest League of Legends skin has an extra little easter egg referencing one of the game’s most famous plays. 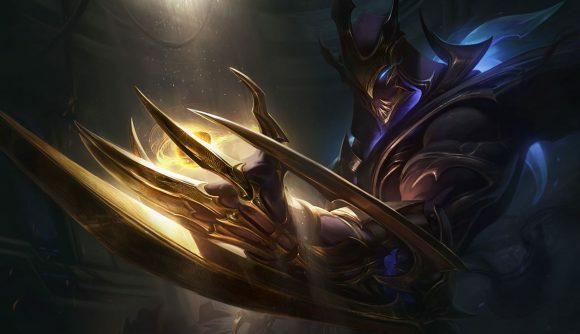 Galaxy Slayer Zed goes live as part of League of Legends patch 9.8, and one of his voice lines references a legendary call for a legendary play from Lee Sang-hyeok of SK Telecom 1. Or, as he’s much better known, Faker. When Galaxy Slayer Zed kills another Zed, you’ll him say “Look at the skill, look at the moves. Zed, what was that?” As Dot Esports notes, that references back to Faker’s famous moment in the OGN HOT6 Champions Final series, when he outplayed KT Ryu’s Zed with his own, prompting Erik ‘DoA’ Lonnquist’s similarly famous call – which this voice line references. Galaxy Slayer Zed will go live with patch 9.8 in two weeks – barring any catastrophic changes to the release schedule – and will be available for 1,920 RP. The patch will also bring us a Conqueror Alistair skin 975 RP, and a set of Invictus Gaming skins to celebrate their victory at Worlds 2018. You can hear all the new voice lines in the video below. The first one showcased is the Faker reference. The player ended up in broader news last year, when Faker donated his October revenue to charity for the UN Foundation. Check out the League of Legends patch 9.7 notes if you’re looking for more details on the game’s current state. We’ll have to wait another few weeks before the new Zed look hits the live game.